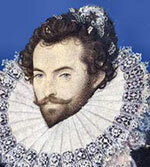 Sir Walter Raleigh was an English explorer, adventurer, historian and poet. He was an influential figure at the court of Elizabeth I, and a noted explorer of the New World. 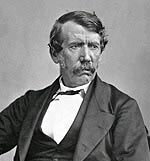 He was a key figure in the English settlements and colonisation in North America, especially in Virginia. He was also a controversial figure for his role in suppressing the rebellion in Ireland. He was executed by King James I for violating a peace treaty with the Spanish. Walter Raleigh was born in Devon (1552 or 1554) to a wealthy Protestant family. He attended Oriel College, Oxford University and briefly fought for the Huguenots in France. Between 1579 and 1583, he made a name for himself in dealing with Irish rebellions. This included being involved in notorious massacres of surrendered soldiers at Rathlin Island and Smerwick. For his role in quelling the rebellion, he was given large tracts of land in Ireland making him one of the wealthiest landowners in Ireland. He was then given rights by Queen Elizabeth I to make expeditions to America (the New World). Sir Walter Raleigh is credited with bringing back potatoes and tobacco to England. Although they had already been discovered by the Spanish, he helped to popularise smoking in the court. On return from the New World, he was richly rewarded by the Queen and rose rapidly in her favour. He was knighted in 1585. A popular apocryphal story about Sir Walter Raleigh involved him laying his cloak over a puddle for the Queen. There is no evidence this actually happened, though it indicates the close relationship between the two. In 1588, the year of the Spanish Armada, Sir Walter Raleigh was involved in providing naval defence against the Spanish Armada off the coast of Devon. He captained the ship the “Ark Raleigh” – which later was bought by Queen Elizabeth I and renamed – “Ark Royal”. In 1591, Sir Walter Raleigh secretly married one of the Queens courtiers Elizabeth Throckmorton and they had a child together. When Queen Elizabeth later found out, she was angry and had both of them arrested and Raleigh was locked in the Tower of London. It is uncertain whether Queen Elizabeth was enamoured with her dashing explorer – Walter Raleigh; jealousy may have influenced her decision. After being released, Sir Walter Raleigh mounted an expedition to South America to try and find – El Dorado – the mythical place of unbounded wealth. In 1603, Elizabeth I died and, shortly after, Sir Walter Raleigh was imprisoned by the new King – James I. Despite little reliable evidence, he was convicted of involvement in the ‘main plot’ – an alleged conspiracy of Royal courtiers against King James. However, perhaps because his trial relied on hearsay, his sentence of execution was commuted to imprisonment and he spent 10 years in the Tower of London. During this period of confinement, he wrote a considerable history of the world The Historie of the World, in addition to his own poetry. Raleigh was released in 1816 so that he could lead an expedition to South America – in search of El Dorado. In Venezuela, a detachment of his men became involved in a fire-fight against the Spanish, breaking previous peace treaties. The Spanish ambassador was furious and successfully lobbied James I to reinstate Raleigh’s death sentence. Citation: Pettinger, Tejvan. “Biography of Sir Walter Raleigh”, Oxford, UK. www.biographyonline.net, Published 1st Feb 2009. Last updated 30th January 2017.